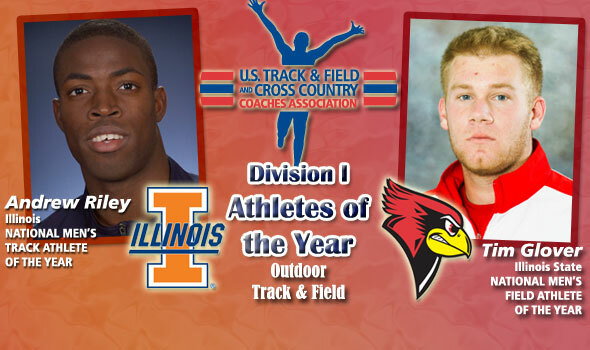 NEW ORLEANS – The U.S. Track & Field and Cross Country Coaches Association (USTFCCCA) announced on Wednesday that Illinois’ Andrew Riley and Illinois State’s Tim Glover are the 2012 NCAA Division I National Men’s Athletes of the Year for outdoor track & field as voted by the nation’s coaches. Riley became the first in NCAA DI history to win the 100 meters and 110 hurdles at the same national championships. Glover won his second-straight javelin title with the third-best throw in NCAA meet history. Riley, a senior from Kingston, Jamaica, became the first in NCAA Division I history to win the 100 meters and 110 hurdles at the same outdoor championships. On the meet’s third day, Riley won the 100 meters in one of the closest finishes in meet history as the top five with a winning time of 10.28 seconds. Riley forged through a headwind of 2.3 meters per second (5.14 mph) to best Auburn’s Harry by two thousandths of a second (10.272 to 10.274) and Florida State’s Maurice Mitchell by five thousands of a second (10.277). Riley entered the NCAA Championships as the 31st overall seed, out of 96 contestants, with a personal best clinched earlier in the season of 10.28. In the meet’s first round, Riley clocked 10.19 and then won his quarterfinal heat in a wind-aided 10.03 seconds. At the finals site, Riley had a real breakthrough, clocking a new personal best of 10.02 in the semifinal. In the 110 hurdles, Riley, the 2010 NCAA champ, won each of the NCAAs four rounds and clocked 13.53 in the final, despite 3.5 meters per second headwind (7.83 mph). Riley won by seven hundredths of a second over Texas A&M’s Wayne Davis II (13.60). Earlier in the season, Riley clocked the collegiate-leading time of 13.28 at the John McDonnell Invitational, moving to No. 8 on the all-time collegiate performance list. Riley also earned first-team USTFCCCA All-America honors in the 4×100 relay as he helped Illinois to the national final in the event. Riley was named the Big Ten Outdoor Track Athlete of the Year and Athlete of the Championships after claiming three conference titles. Riley won the 100 meters, 110 hurdles, and led off the Illini’s 4×100 relay to the league crown. Glover, a junior from Normal, Ill., won his second-straight NCAA title in the javelin this season. Glover uncorked a fourth-round throw in the national finals of 268-0 (81.69m) to take the lead and victory from Texas A&M’s Sam Humphreys. His best mark was the third-best in meet history and the best since 2009. Glover recorded a six-throw series with every throw measuring more than 235 feet and had two throws over 250 feet. Glover entered the championships as the top-ranked thrower of the year via a best throw of 266-9 (81.31m) to take top honors at the Sea Ray Relays. Glover now stands No. 9 on the all-time collegiate performers list in the event. He won the Missouri Valley Conference title in the javelin for the third-straight year as well.